The Petrie Coventry is a lace-up Jumping boot with a rear zipper down the calf and a protective edging making it easy to slip on and off. A very flexible boot with a very tight fit throughout, even around the ankle. 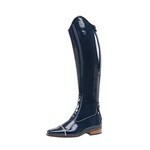 The shaft with its calf leather lining gives a great grip and good contact with the horse. There is an extra zipper guard and the heel protector, specially designed for spurs also protects the zipper. The Coventry has a fashionable pointed toe and the shaft has a 5 cm high bowl at the top. The demanding rider will find the special comfort foot-bed and the slim ankle fit very useful. The Ago glued sole has a non-slip profile and is extremely durable. The Petrie Coventry is a lace-up Jumping boot with a rear zipper down the calf and a protective edging making it easy to slip on and off. A very flexible boot with a very tight fit throughout, even around the ankle.